The Gatineau Gliding Club (GGC) is a non-profit volunteer run organization dedicated to promoting motorless flight in Canada. We have approximately 100 members flying from Pendleton Aerodrome (CNF3 123.3MHz Unicom) located approximately 50 km southeast of Ottawa, Ontario. GGC offers DAY MEMEBERSHIP GUEST FLIGHTS – CLICK HERE! The Gatineau Gliding Club is the longest continuously operating gliding club in Canada, first incorporated in 1942. The Pendleton aerodrome was built as part of the British Commonwealth Air Training Plan (BCATP) during WW2 and help to cement Canada’s reputation as the “Aerodrome of Democracy” in training Allied pilots during the war. Pendleton was home to #10 Elementary Flight Training School until the end of the war. A commemorative plaque was erected by the RCAF association at the aerodrome in 2000 to commemorate the role of #10 EFTS and Pendleton aerodrome. That spirit continues to this day at GGC. 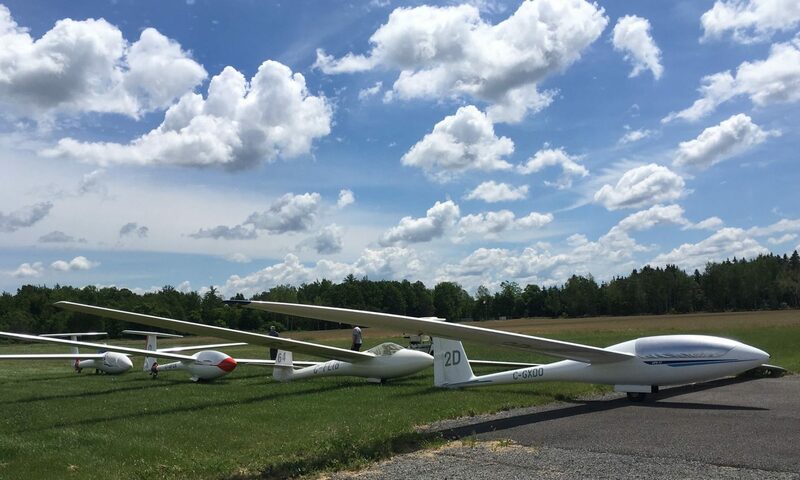 We provide primary and advanced glider pilot training and gliders to club members and current and former national Canadian soaring champions have made GGC their home. Members are encouraged to pitch a tent and stay out at the airfield for the weekend as the club offers full kitchen and shower facilities. Hardly a summer evening goes by without a fireside story of the days’ flying adventures or a walk around the runways searching for shooting stars. With some of the best flying and recreational facilities available at any gliding club in Canada, GGC certainly is a place to learn, have fun and meet new friends with a passion for “pure” flight.